Mary from the Prairie: Aw, Fudge! I love the autumn months. It’s my favorite time of year, really. Not necessarily because of the change of seasons. In California, there is not much change of season to begin with. It’s not because children are returning to school and all the projects that go with it. And I am not a Halloween fan. Football has its merits, but that’s not what makes the season special. What you do: Empty the bag of chocolate chips, the bag of hazelnuts, the can of sweetened condensed milk, and the ½ jar (or so) of Nutella into a glass mixing bowl. Stir all this stuff together, then cook it on high in the microwave for 1 ½ minutes. If it’s not completely melted, cook it for a minute or so more. When everything is melted together, pour the goo into your pan. 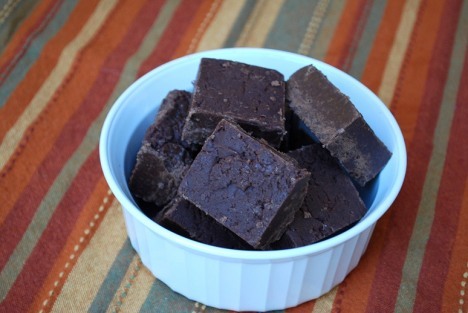 Chill the fudge in the refrigerator for a couple of hours or until it sets. Cut it into bite-size pieces. If you want to be stingy and keep the fudge all to yourself, that’s up to you. But you keep your friends longer when you share this goodness with them. *The claims of Nutella Feel-Good Fudge as a healing catalyst have not been officially endorsed by the FDA. But who cares? It still makes for a good story.